Plot : While a plague of arrogant young suitors camp in his house, feasting and laying waste to his flocks and vineyards; Odysseus is struggling to return home, and must face the giant flesh-eating Cyclops, the magical witch Circe, the besotted nymph Calypso, the spectres of the dead in Hades, the seductive song of the Sirens, and the twin threats of Scylla and Charybdis. My thoughts : If The Iliad was a slug-fest war story, The Odyssey is an adventure story, a one man quest filled with magic and monsters. Ray Harryhausen must have loved it. In some ways a sequel to the events of The Iliad (classical scholars are divided on which was written first), The Odyssey starts by describing the fate of many of the Greek leaders from that story, including Achilles, Agamemnon, Menelaus and Nestor ; in tandem with the shameful events in Odysseus’s own palace brought about in part by his prolonged absence. The central third of the story is told in flashbacks by Odysseus himself, describing the fantastical adventures he faced; before the climactic conclusion of his homecoming and defeat of the Suitors. For my money, I found this a more interesting read than The Iliad, which was very repetitive despite its remorseless build towards a tragic end. I understand the repetition of phrases was a feature in being able to recite sections orally for an audience, but it does tire when on the written page. However, The Odyssey is more varied and kept my interest due in large part to the encounters with mythological beings as well as the Gods, and the buildup to his defeat of the gang of Suitors. Odysseus is more human and prone to mistakes, partly because he loses some of the glory and status he wore on the battlefield. The Trojan Horse is also mentioned in passing, so my comments on that score in the Iliad review stand corrected. My copy for this project was the Penguin Classics edition, edited by E. V. Rieu. (9780140449112), but there are many different versions available. Agamemnon’s fate is also the basis for later tragedies by Aeschylus, Sophocles and Euripides. There is obviously some value in reading literature chronologically, as now his back story as Leader of the Greeks and the reason for his own long absence is already known. 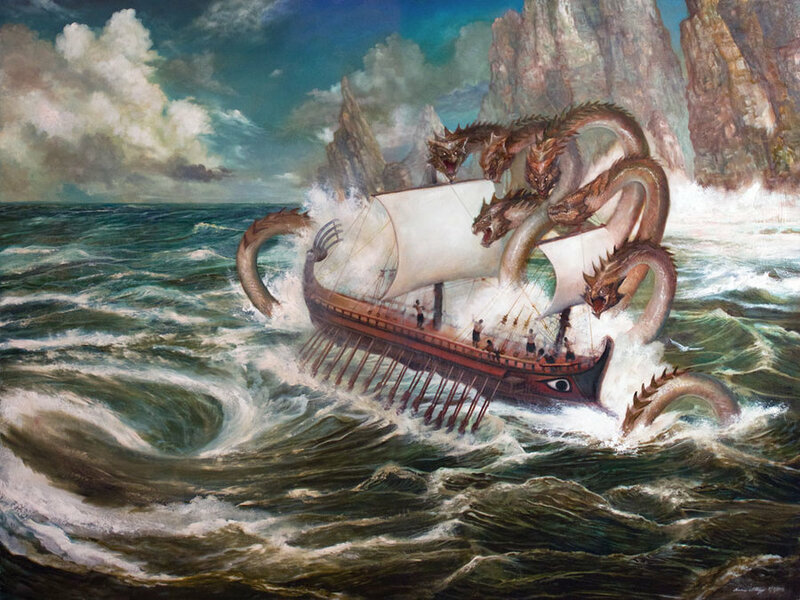 The mythological quest story will also reappear in our readings when Jason and the Argonauts go in search of the Golden Fleece, a legend set before the Trojan War but surviving in recorded form by a version after Homer. There is also a more modern appropriation of The Odyssey (a term my teenage daughter taught me this week) in James Joyce’s Ulysses, which is years away for us yet.